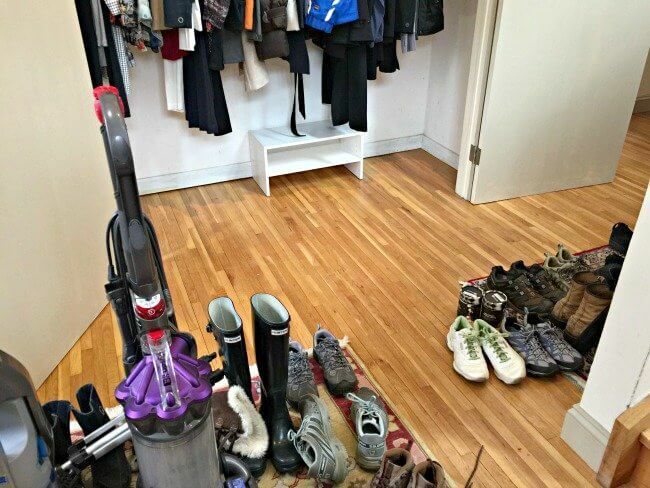 How to Declutter Your Entryway and Mudroom! 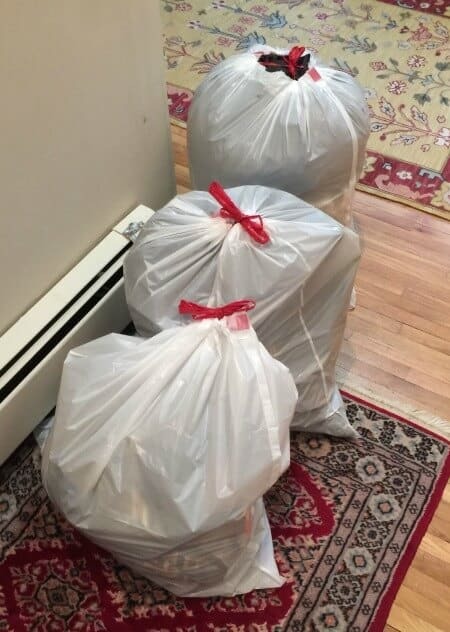 This post is part of the Busy Moms Decluttering Challenge! We are working through Ruth Soukup's Book “31 Days to a Clutter Free Life“- taking one week to work on each of the decluttering assignments. You can see all of our Decluttering Challenge posts here! 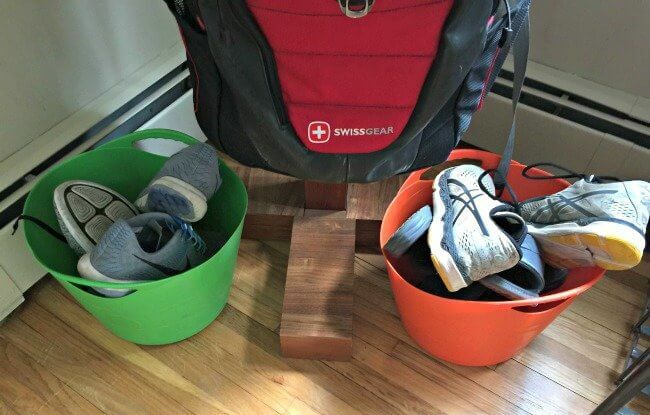 The two bins that I had at the door were no longer large enough to fit their teen-sized shoes! And after a few shoes were in a bin- the rest would never fit- so it was time to find a bigger bin! 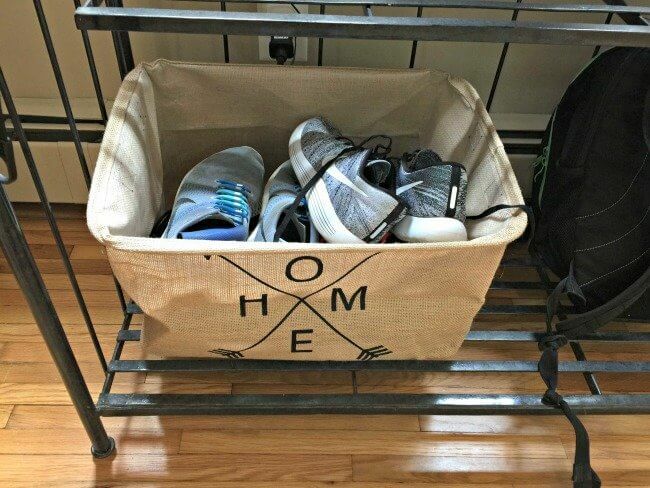 I settled on this pop-up tote (I love pop up totes, I also use them to store blankets in the family room and game room, as hampers, etc) which is large enough that shoes can go in flat and be stacked on top of each other when needed. And I moved it away from the backpack rack and onto the baker's rack so everything would be out of the way. And of course- I emphasized to the kids that I now expected them to use the new shoe bin and baker's rack and no longer leave their things on the floor! Next it was time to tackle the front closet- and here we were storing way too many things that either didn't belong in this closet- or were coats and shoes that my husband and I don't wear anymore. We started from the ground up- emptying just one area at a time, cleaning it, sorting what was in it, and then putting back only what we wanted to keep. Before we finished we collected 3 bags of items we no longer needed- just from this closet alone! 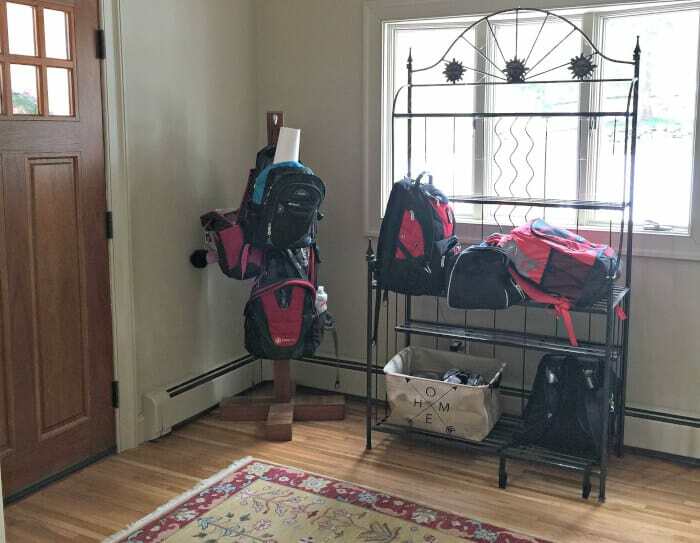 Our mudroom area is where all of the kids' coats, shoes, sports gear, sunglasses- and so forth are contained. 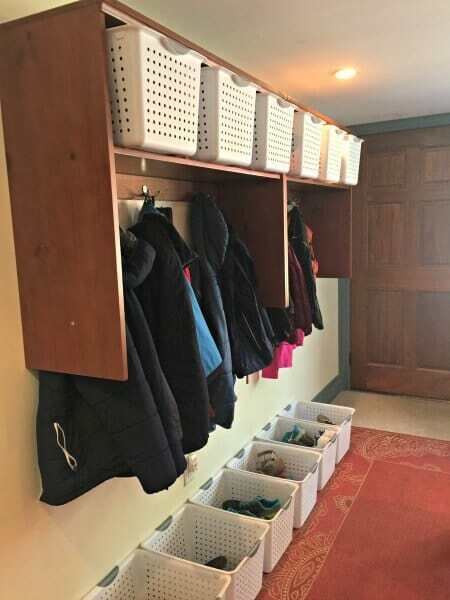 They have locker-style cubbies for hanging their current season's coat right when they walk in, and they have bins for shoes (when they use them!). This area only needed a general clean up- like putting away their snow pants left out from the winter and moving out the shoes that they've since outgrown from the fall (the ones in good shape go into the closet to be passed down to a younger sibling- those that are worn out are tossed). 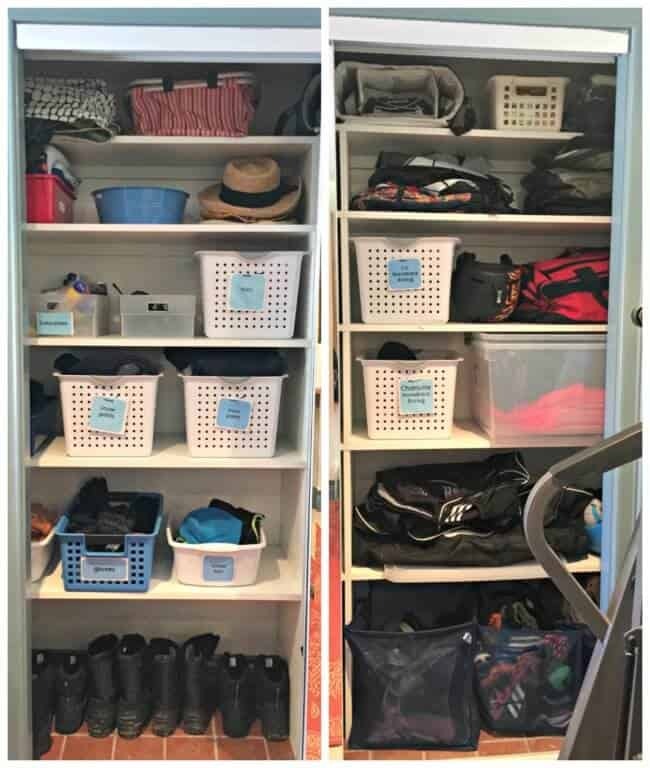 And one story about decluttering that I would like to share is about a large bin of sports equipment that a friend gave me thinking that perhaps that my kids could use it, that I had stuffed into this closet. But here's the thing- this equipment was for a sport that my kids don't even play, nor have any desire to play. But it was good stuff- quite valuable! So I kept it around…. for 2 years! 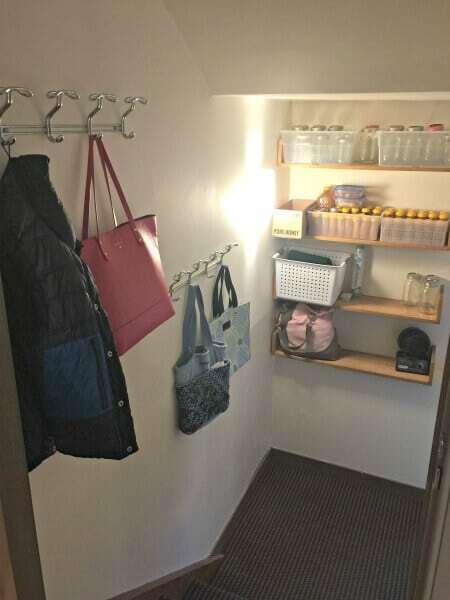 But this time when I looked at it- and I asked myself those decluttering questions- do I love it? (no), do I need it? (no), do I want it? (no) and do I have room to store it (not so much!) and I knew it was time to let it go. So I packed it up and donated it. Without sadness and without guilt. It was time to reclaim my space! 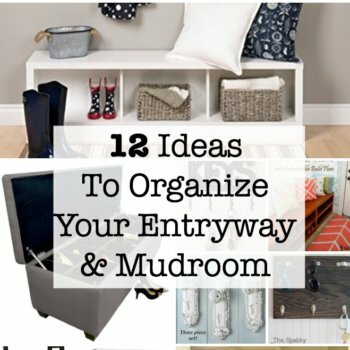 Looking for Some More Ideas for Your Entryway and Mudroom? 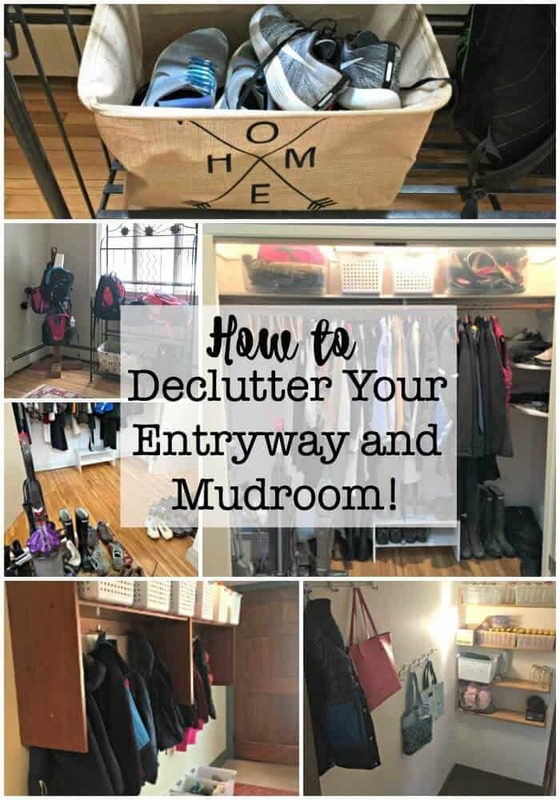 I shared a post earlier this week on ideas for entryway and mudroom organization– something you'll want to do once you get those areas decluttered! Want to join us in the Busy Moms Decluttering Challenge? 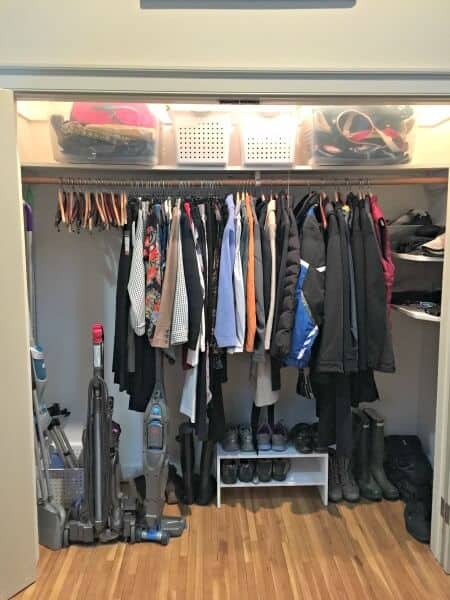 If you want to declutter with us- check out our facebook group where we will be posting before/after photos and sharing ideas, frustrations, and success stories! We'd love to have you! *Please note that some of the links in this post are affiliate links, which means I will make a small commission if you purchase through these links. It’s a great way to support a blogger! « How old should kids be to play Call of Duty?